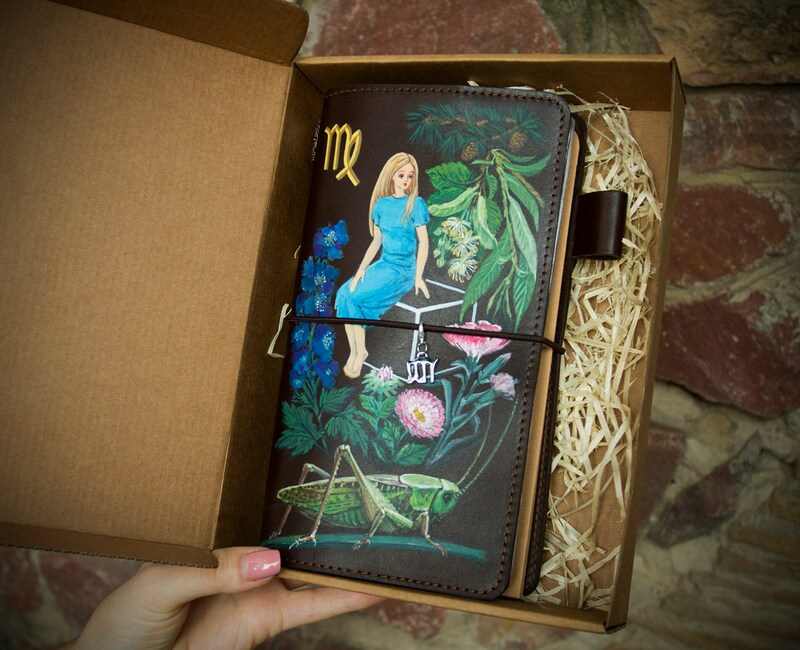 Looking for a perfect Zodiac sign Virgo / the Maiden gift? We made a lot of research on the field, and came up with a perfect composition for a hand painted leather notebook our Sanati Factory studio is famous for. All the symbols shown correspond to this Zodiac sign. A transparent PVC pouch with zipper compartment for credit cards, bills and tickets is included in the set. It costs 6-9 USD elsewhere as a separate item but here we decided to include it in this beautiful notebook set. By default we include black paper inserts, you can use white gel pen for writing on black paper. You can ask for any three inserts, either from this listing, or from other listing in our shop, in any variations. Full height inner pockets are included. Penloop is there for the best pen for this notebook. Please note that we can make it any size, and usually the price is the same, just add it in the order notes. Also we can put a name in the painting without extra payment, just add the name in the order notes. This is our Sanadori Travelers pure high-quality 2-mm Italian cowhide leather Notebook that includes three inserts, small notepads. * All handpainted notebooks are unique, and even though we publish a sample of the work in the listing, you can ask for modifications on size and leather color, even some adjustments on the picure. You can ask for your picture/photo or of dear ones to be painted. Our artists are professional and love to create something really outstanding. So you can be confident that no other person on the planet possesses exactly the same item. The paints are special, for painting on leather and textile, so they are not cracked and will stick for years. * We have light machinery in the studio including tools for working with leather but some of cutting and all the sewing and handstitching processed are made by hands, as will as finishing tasks. We put grommets in different configurations, and add elastics that is both soft but keeps the inserts nicely. So the leather work is our advantage as well. * Zipper PVC pockets and craft paper. These small handy things help a lot anyone who is travelling and along with writing travel notes has to keep small papers, coins, bank notes and cards. Zipper PVC is very secure for valuable little things to carry with you. We also add inner leather pockets on request, for cards and tickets. Also we add penloops. You can ask for custom width and placement. * That is communication and ability to resolve issues. Whatever the problem is, we work closely with the buyer to solve it. And usually we reply to any requests within a couple hours in the daytime. The size of the cover is 22 cm x 13 cm. The size of inserts is 21cm x 11cm. Venice undated design. You have 31 days, each split in two pages. One notepad = 31 days, one month. This is the first refill, 64 pages. The second is equipped with grid and thematic illustrations. 64 pages. The third is pages with lines and thematic illustrations. 64 pages. You can choose any combination of grids/lines for your London Midori. So overall we have 192 pages. And we have a metal clip for taking some additional things at the top. We did it, Alex Radich (graphic design) and Natali Radich (trimming, cutting, sewing, putting everything together), Tatyana Kusaylo (the artist). Get 15% off your order when you spend $120 at this shop. Discount shown at checkout.